Ductless air conditioning systems are great for residential retrofit installations. These systems provide whole home cooling without the need for ductwork. Many of our customers opt for the added benefit of the heat pump versions. Heat pumps provide year round comfort while drastically reducing the cost of heating your home. A. J. LeBlanc Heating specializes in central air conditioning. Our technicians fabricate superior duct designs reducing the drafty home feeling while increasing system efficiency. Need an A/C tuneup or repair? Call A.J. LeBlanc Heating & Air Conditioning today. Our skilled HVAC technicians will diagnose system issues and will have your homes comfort system up and running in no time. A.J. LeBlanc Heating is known for high quality HVAC installations. Our technicians are clean, friendly, and are willing to work with homeowners on the aesthetic aspects of the installation. A.J. LeBlanc Heating provides 24/7, 365 emergency hvac service to all existing customers. Sumbit a service request online or call our answering service any time any day. LeBlanc Heating sells and installs all brands of mini split systems. These systems have the ability to both heat and cool without the need for ductwork. These systems are perfect for supplementing your fossil fuel based heating system and they include the added benefit of air conditioning. We are ductless air conditioning experts. 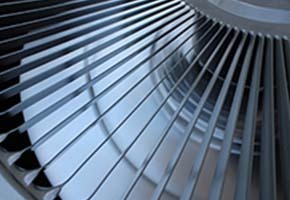 LeBlanc Heating sells and installs all brands of central air conditioning systems. Central air conditioning both cools and dehumidifies a home during the summer months. LeBlanc Heating will not over size your air conditioning system; instead we will describe your A/C options. We are central air conditioning experts. LeBlanc Heating sells and installs all brands of heat pump systems. 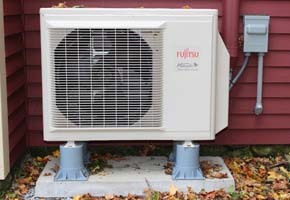 Heat pumps can both heat and cool a conditioned space. 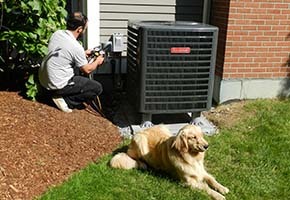 Heat pumps add value through their ability to cut heating related costs. LeBlanc Heating will not over size your heat pump system; instead we will describe your heat pump options. We are heat pump experts.